“A humorist who spent 22 years waxing his Uncle Josh stories, Cal Stewart was the first performer whose stage appearances were celebrated by reference to his records rather than the other way around. 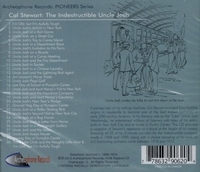 In 1908, Cal Stewart recorded 25 of his best routines for the Indestructible (celluloid) cylinder company of Albany NY. Together with a handful of cylinders made for the U-S Everlasting company, these show Stewart at the height of his career, allowing us to appreciate his repertoire at an advanced state of development. 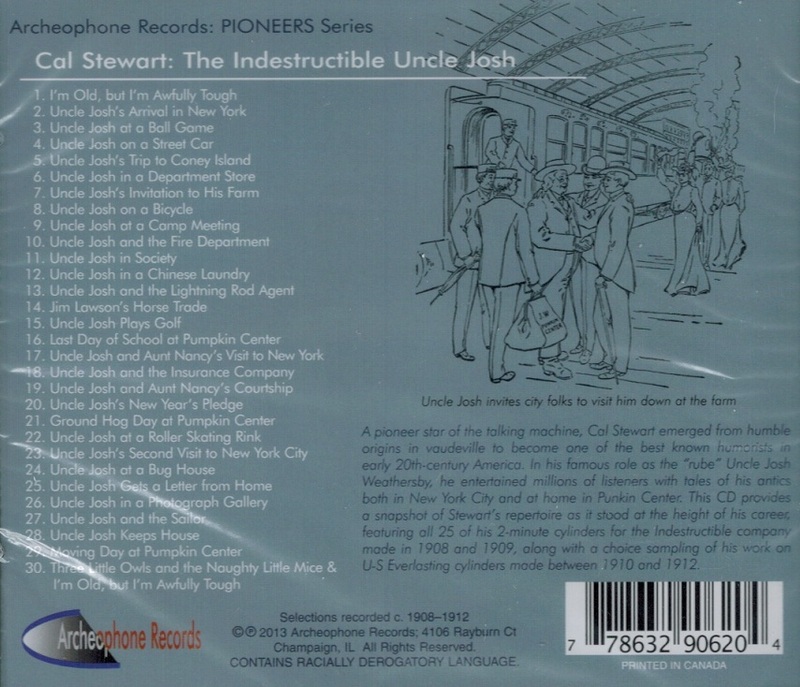 With a 28-page booklet of notes by Stewart expert, Patrick Feaster, and a clear, vibrant sound that gives us the chance to hear Stewart distinctly, THE INDESTRUCTIBLE UNCLE JOSH is the first commercial release of a Cal Stewart collection and one sure to please the thousands of his fans. In the late 19th century, ‘Uncle Josh’ was commonly used as a generic comical name for elderly rural characters. But, despite having appeared in THE OLD HOMESTEAD, in which Denman Thompson played Uncle Joshua Whitcomb, Cal Stewart created a character all his own in Uncle Josh Weathersby. And, like its most famous citizen, the town of Punkin (or ‘Pumpkin’) Center grew a personality gradually over time. By sequencing the tracks on this CD in the order in which Stewart originally unveiled them in his act, we are allowing modern audiences to get to know both the man and the town much the same way audiences of a hundred and more years ago would have. 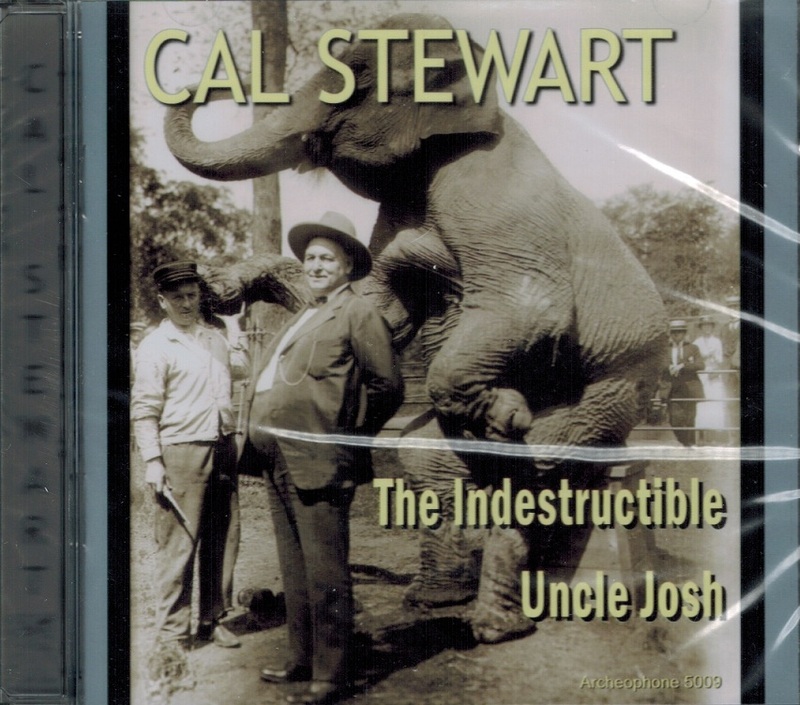 Most of the material Cal Stewart chose to perform for his Indestructibles had already stood the test of time for a decade or more, and he recorded the majority of them for all the companies that sought his services. The routines developed between 1899 and 1901 find Uncle Josh much in need of adult supervision. He parodies a sermon when the camp meeting comes to Punkin Center; he makes a citizen's arrest of the fire chief when he unwittingly calls the fire deartment to answer a false alarm; he learns how cold ice cream is when he gets hooked up with society folks; he ends up in a tussle with a ‘heathen critter’ as he tries to claim his wash at a Chinese laundry; he gets buncoed again by the lightning rod agent; and he gives a traditional telling of a story in ‘Jim Lawson's Horse Trade’, as Uncle Josh is not himself the subject of the story. But he's back to his mischief when he plays a game of golf, as Aunt Nancy loses her glass eye to his bad swing.